Ghanaians are asking the question of when if not now, to fight corruption in Ghana? 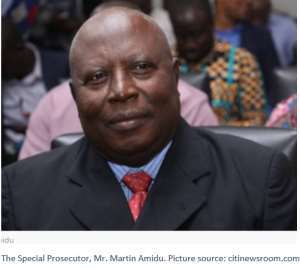 For several months after he was sworn into office, Mr. Martin Amidu complained that lack of funds from the government had hampered his office from carrying out its mandate. Then, in 2018 budget statement to parliament, Hon. Ken Ofori-Atta, the Minister of Finance, proposed GHS 180million for the Office of the Special Prosecutor. When is Mr. Amidu going to start the first case of an alleged corruption? His deliberate silence could either mean that the said money is yet to arrive or it has arrived but certain political entities from both sides of Ghana’s political divide are hampering his effort. We are already in the fourth month of the year 2019 and general elections are looming in 2020. So, our question again to the Special Prosecutor is when if not now? The noble people of Ghana are looking up to you and demanding more from you, Mr. Special Prosecutor. Citinewsroom.com (2018), Office of the Special Prosecutor gets 180m [Online] Retrieved from https://citinewsroom.com/2018/11/15/ghbudget-office-of-special-prosecutor-gets-ghc180m-to-fight-corruption/ [Accessed 7.4.2019].